Home » VectorVest » Buy Urals Energy #UEN says VectorVest. Fundamentals & relative timing add up to a highly attractive oil sector play. Buy Urals Energy #UEN says VectorVest. Fundamentals & relative timing add up to a highly attractive oil sector play. By Alan Green in VectorVest on 27th February 2018 . AIM listed Urals Energy (UEN.L) is an independent oil company with its operating assets located in Russia. UEN is primarily engaged in oil and gas exploration and production in the Russian Federation and processing of crude oil for distribution on both Russian and international markets. The Company’s exploration and production operations are on the Kolguyev Island based in Timan Pechora and on Sakhalin Island. The Company’s ZAO Petrosakh develops the Okruzhnoye field on the Eastern coast of Sakhalin Island. The Company’s ZAO Arcticneft develops and operates the Peschanoozerskoye field on Kolguyev Island in the Barents Sea. The Company is producing on average approximately two thousand barrels of oil per day from Petrosakh and Arcticneft with 100% of production being refined in Petrosakh and 100% being exported in Arcticneft. On December 21st 2017, UEN published an update on its reserves, and on progress in drilling at the South Dagi licence on Sakhalin Island. UEN said it had spudded its first exploration well at South Dagi, adding that any oil production from the new wells will be transported by road tanker to the Company’s refinery at Petrosakh, a distance of 400 kms, which will increase the utilisation rate of the Company’s refinery. No additional investment will be needed to process both the heavy and light oils expected from South Dagi. 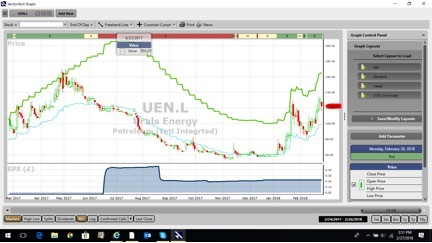 The potential earnings growth from UEN’s E&P activities had been identified by VectorVest stock analysis metrics as far back as August 2017, long before the January spike in the share price. Despite the sharp rise, UEN continues to score highly across all key VectorVest metrics – the GRT (Earnings Growth Rate) metric retains a forecasted GRT of 36%, which VectorVest considers to be excellent. Although the RS (Relative Safety) metric at 0.86 (scale of 0.00 to 2.00) is low, UEN scores an excellent RV (Relative Value) rating of 1.51 on the same scale. VectorVest now attributes an overall value of 166p for UEN, meaning that at today’s 122p the stock is undervalued. Overall, UEN will be most suitable for investors who can manage risk and understand position sizing techniques. The chart of UEN.L is shown above in my normal format. The share rose strongly in price during January 2018 and subsequently retraced to test the previous resistance that was in place since October 2017. Presently the share is on a Buy recommendation on VectorVest and pushing on a 26 week high. Technical Analysts reading will note the large “cup and handle” formation that the share has charted over the last 9 months. This is a bullish pattern and with a close above the 26 week high, the probabilities favour a move higher. Summary: Although the UEN share price drifted lower for the majority of 2017, the developments at the South Dagi oil prospect has seen shares double in value in a very short space of time. As I would expect with oil E&P stocks, the low VectorVest RS rating may see cautious investors look elsewhere, but nonetheless, UEN fundamentals, earnings growth and current valuation gap all add up to a highly attractive oil sector play at this moment in time. Buy. 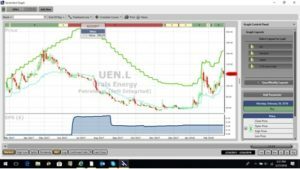 Readers can examine trading opportunities on UEN and a host of other similar stocks for a single payment of £5.95. This gives access to the VectorVest Risk Free 30-day trial, where members enjoy unlimited access to VectorVest UK & U.S., plus VectorVest University for on-demand strategies and training. Link here to view.